If you've ever had to hold down a screaming kid while a frustrated hair stylist tried unsuccessfully to cut his hair, then you understand the need for kids' hair salons. Regular hair care centers are just not geared towards kids. With their plain white walls, tall chairs, impatient hairstylists, and quiet atmospheres, these shops are boring and intimidating for children. 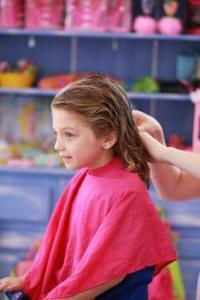 Kids' hair salons are a growing trend and shops are available in most major cities. Hair salons for children typically offer movies, video games, books, or toys to keep kids entertained -- and still -- while stylists who are specially trained to deal with kids do the haircutting and styling. Some are geared more towards kids' spa adventures and offer manicures, pedicures, highlights, and formal hair-dos. Some children's salons offer additional services, such as birthday parties and ear piercing. Many offer their own kids' hair care products. Many kids' hair salons are franchises with shops open nationwide. Others are smaller shops with only one location. 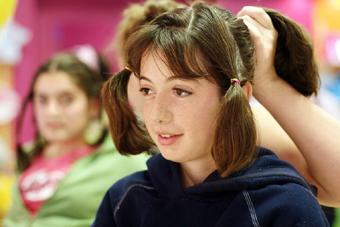 Pigtails & Crewcuts offers a fun environment for kids' haircuts. Kids sit in racecars, airplanes, and fire engines while kid-friendly stylists cut and style their hair. Television sets abound on the brightly colored walls and toys are scattered around the floor. Pigtails & Crewcuts also offers nail painting, hair accessories, and birthday parties. This shop aims to make haircuts an exciting experience rather than a dreaded chore. Pigtails & Crewcuts is a nationwide franchise with new locations opening all the time. Snippet's Mini-Cut is an Illinois kids' hair shop with three locations and more planned. In addition to regular shampoos and haircuts, Snippet's Mini-Cut also offers up-dos, braids, hair coloring, and manicures. The salon also offers birthday parties. Cartoon Cuts has locations in Virginia, Maryland, Texas, Florida, and Puerto Rico. The salons are geared towards kids under age 12 and feature video games, movies, bright colors, cartoons, and Ellie the elephant. Cartoon Cuts also offers birthday parties. Snip-its is a fun, brightly colored salon with colorful characters adorning the walls and ceilings. Kids play computer games while specially trained stylists cut and style their hair. After the haircut, kids get a special prize and a lollipop. Snip-its also offers Glamour Parties. Their website is informative and offers a special section for parents. Cool Cuts for Kids is another fun hair salon for kids. Kids sit in colorful chairs designed as cars, airplanes, and fire engines. They watch movies or play Nintendo games as they get their hair cut. Cool Cuts 4 Kids also has an enclosed play area for siblings to play in as they wait. This salon currently has shops in Arizona, California, Colorado, Florida, Illinois, Indiana, Kentucky, Missouri, Nevada, North Carolina, and Texas. Sweet & Sassy is the place for kids who want to be pampered. Offering manicures, pedicures, highlighting, and make-up application, Sweet & Sassy caters to high-maintenance kids! They also offer kids' birthday parties in themes like Spa Girl, Karaoke, Makeover, and Sleepover. Sweet & Sassy currently has locations in three states with more locations coming soon. If none of the franchises listed above have locations in your area, you might be able to find a local independent shop. Check your local yellow pages or search at the Yellow Pages online.